George Washington died in 1799, and according to his will, all of his slaves were to be freed upon his death. His wife, Martha, however, had been married before, and she had slaves from her first marriage. According to the law, slave ownership passed along the male line, meaning Martha’s son from her first marriage managed the rights of those slaves. As some of the slaves intermarried, George’s “freed” slaves would not have wanted to leave their non-freed spouses or children. How were slaves treated? Were all slaves treated the same? What steps did some slave-owners take to protect slaves? George Washington visited Connecticut on more than one occasion. How might he have encountered slavery here? 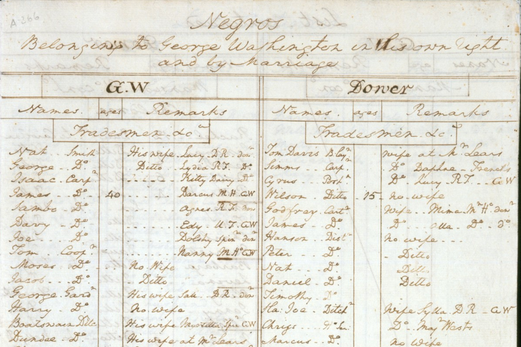 The first page of the slave census in George Washington’s 1799 will – Mount Vernon. How many different jobs can you identify on the slave census? Do these jobs appear to be farm jobs or skilled trades? What is the relationship between the gender of the slave and the job that he or she performed? Is there any evidence that children worked at Mount Vernon? How might the work of slaves been different in Connecticut than in Virginia, and why? Or was it different? Divide students into different groups and have each group decide what type of slave job they would perform. Randomly pass out cards with either G or M on them. Let students know the G means they are George’s slave or M is Martha’s. Now that George’s slaves are free, what would that mean for the rest? Have students decide what to do in each group and report out to the rest. Extension: Group students into 3 or 4 and make them family groups. Have students decide how their family groups would be made up (for example, have mother, father, children, older family, etc.) Do the same as above with the G and M cards. How would this be different than the job activity? Have groups report out and compare to the earlier task. Have students research slavery in Connecticut and compare it to slavery in Virginia. Are there similarities? Differences? Why do they think that is? 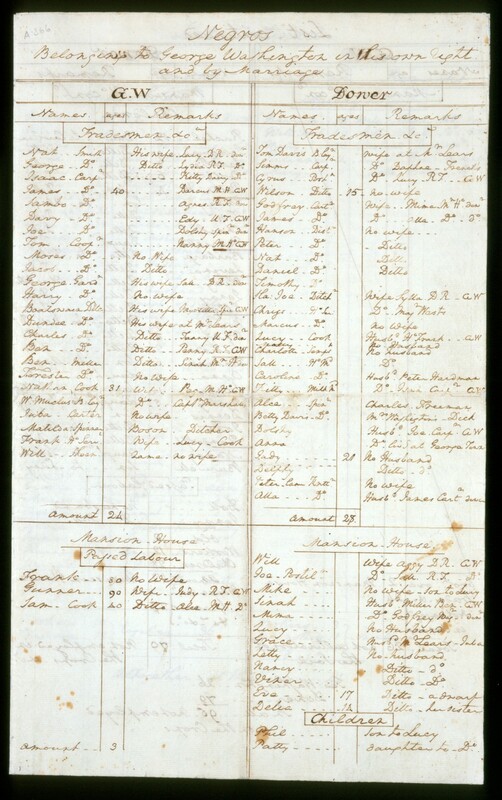 Examine the slave census in George Washington’s 1799 will from the online “Biography of George Washington” by MountVernon.org. Read these original documents held in the collections of the Connecticut Historical Society – A bill of sale by Beriah Bill of Norwich, Connecticut, 1781. Bill purchased and then enlisted the slave Backus Fox in the Continental army to fulfill his share of the town’s quota for military service during the Revolutionary War. A broadside or leaflet dated 1803 announcing a reward for 18-year-old runaway slave Caesar.